When it comes to Android tablets, ASUS has had a lot of success. Its Transformer series was one of the most popular Android tablet lineups before Google decided to launch the Nexus 7, which was also made by ASUS. Today, a line of new ASUS tablets were spotted heading through the FCC to get their certification, one of which looked like it was capable of running Android alongside Windows. 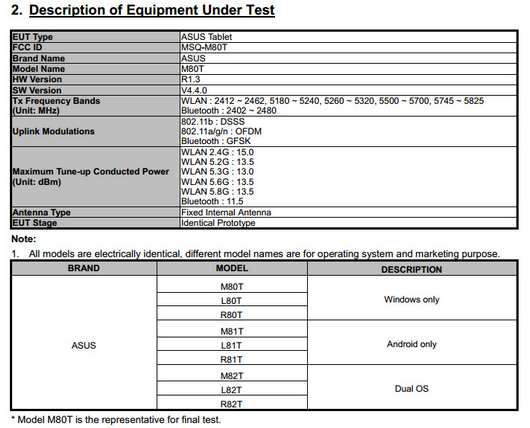 Three different tablet model numbers were listed under the Dual OS category: M82T, L82T, and R82T. The FCC filing lists there being a 32 and 64GB variant of this tablet, but we can’t be sure what separates the three model numbers from each other. A 3,910mAh battery is listed on board for this tablet as well as a front and rear camera. The filing does not list much other than that, but with CES only a few weeks away, we might not have to wait long to see the rest. Does a dual-booting tablet interest you? Still interested in a possible Nexus 10 refresh instead?